Before anyone yells, "Fake!" Realize that this is a mock-up. This was posted on Gathering Magic and other sites today so you have them to thank for creating the mock-up. It will be replaced with the real version once WotC adds the real version to the M12 Image Spoiler. Regardless, I felt like this deserved its own post. G4TV's Attack of the Show actually previewed this today. All of the speculation and rumors have turned out to be true (except for all of the fake versions people have come up with of course). +1 Draw a card. Target player puts the top card of his or her library into his or her graveyard. 0 Target player puts the top ten cards of his or her library into his or her graveyard. -7 Any number of target players each draw twenty cards. 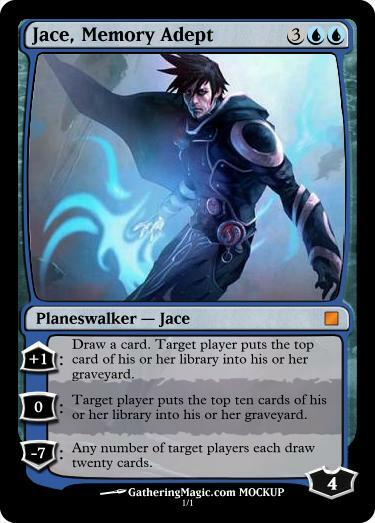 This is Kylak signing out and glad that they finally balanced Jace.